Japan means pearl. Pearl means Mikimoto. Yes, this is the first phrase that comes to mind at the mention of Mikimoto. The slogan belongs to the Tokyo store: a poster once adorned its storefront. Mikimoto is the pearl legend, Pearly King of Japan. Mikimoto pearl jewellery history began in 1893 when Mikimoto Kokichi became the first to artificially cultivate the most mysterious treasure of the sea – pearls. However, at the time Pearl had so far only a hemispherical shape. Six years later Mikimoto opened his first pearl boutique in the prestigious district of Tokyo – Ginza. 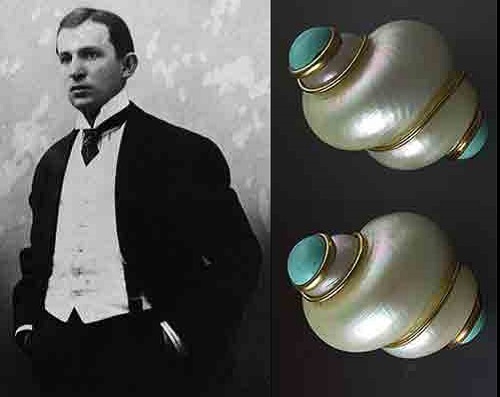 In 1905, Kokichi managed to create a perfect round pearl, and inspired by the success, the future Pearly King said: “I would like to decorate with pearls necks of all the women of the world” – well, looking ahead, we can safely say that he did it. 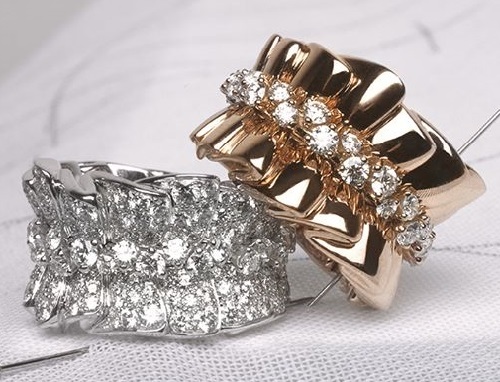 French fashion house Dior unveiled a new collection of fine jewelry by French jewellery designer Victoire de Castellane, the chief jeweler of Dior brand. Victoire de Castellane Silk Dior jewellery – bracelets and necklaces, like curls of satin ribbons and lace ruffles, bows earrings with gift boxes, and other decorations in the most unexpected forms. Dior fine jewelry is far from being something static. The new collection of Soie Dior fine jewelry to some extent breaks the stereotypes. Although all the ornaments are still, Victoire de Castellane and craftsmen of Dior House managed to create a very compelling illusion of movement. Necklaces, bracelets, earrings, rings – gold really comes alive in every subject. The very idea of the frozen moment in time is found in the delicacy with which the jewellery has been crafted and it seems at every moment that the next will be different, carried by the movement of the ribbon made of gold, in the midst of a construction of gemstones. “When you toy with a ribbon, it is instinctive, it is ephemeral, and I wanted to retain that idea of freedom in play”, explains Victoire de Castellane. British jewellery company “Exquisite” (1914 – 1970) was founded by engraver Augustus Harry Power (1878 -1952) and Clarence Oswald Flint (1880 – 1946), in the city of Solihull. These two men bought the jewellery business from a jeweler named Walter Archibald Parker Watson (1880 – 1952). The Exquisite Vintage costume jewelry became especially popular after the Second World War. Normally, Exquisite hand enameled jewellery is recognized original, high-style standard, level and quality. Though the main brand name was Exquisite, they also produced Mirella and originally Myths and Magic by the Tudor Mint. They also produced the sterling silver souvenir charms for tourist visiting the UK. 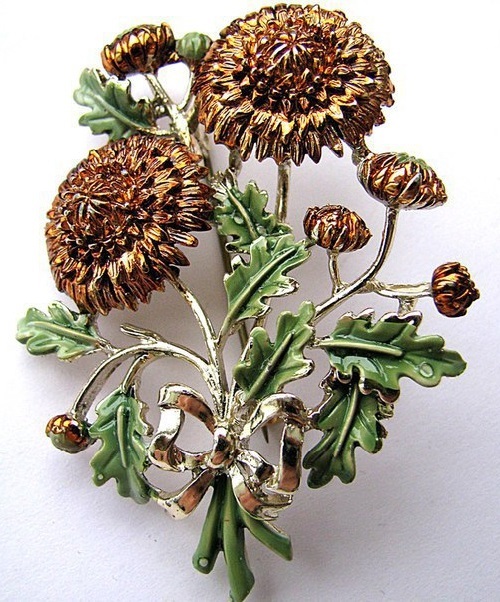 Exquisite costume jewellery was hand painted enamel, or made of gold or silver plate. The Exquisite jewellery is desirable, rare, expensive and collectible today. Luxurious Tudor era dress – magical, luxurious and fabulous items of clothing so carefully preserved for us by masters of Western European painting. Art and fashion are intertwined: and today a source of inspiration for designers are works of old masters, as a true reflection of fashion. Tudor era fashion belongs to the period of 1485-1603, a time in English history presented by two most famous Tudors, Queen Elizabeth I and her father Henry VIII. The wealthy people of the time would wear clothes of bright colors made from luxurious materials such as silk, and velvet; fur was a popular trim among the wealthy. The lower classes would wear clothes made from wool and linen, the poorer women wore simple clothes – a long dress with an apron on top. 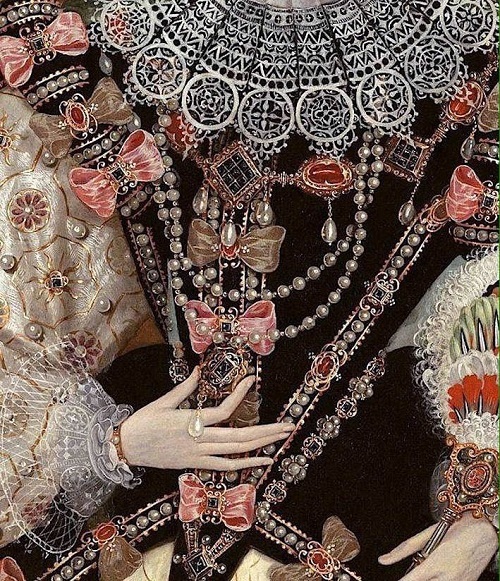 The most recognized item of clothing was the ruff – a collar of lace worn around the neck, and wealthy people wore enormous ruffs to show off their wealth. Sea air, warm sand, sunshine playing on the surface of the water – this is inspired by sea Seaman Schepps jewelry made of shells. Even in the name of the designer Seaman – “man of the sea” is heard surf and predestination of fate. But he was not the sea wolf, he was a lover of the gifts of the ocean. Manager of antique jewelry shop Mr. Schepps once had a chance to see what Fulco di Verdura, Duke and Marquis, was doing out of the ordinary shells, Seaman Schepps was impressed. Admiration turned into decoration, quite reminiscent of jewels by his idol – aristocrat from the coast of Sicily. However, Schepps brought his own vision in jewelry design. In the circles of experts and professionals Viren Bhagat is believed to be the one of the foremost contemporary jewelers. I saw the works of Viren at the exhibition in the Kremlin in 2014, and I was impressed. Viren Bhagat was born into a family that has more than a century engaged in jewelry business, so the interest in the art of jewellery was pawned in his childhood. Today, he states that he never tried to make jewelry for other people, and worked exclusively for fun. However, his decorations are in high demand and often bought at the stage of work on them. Prices of his products are usually expressed in seven-digit numbers, but this does not stop connoisseurs. Viren unique style – a synthesis of the traditional motifs of the Mughal Empire and modern trends. His “calling card” became the most subtle, barely perceptible rim of platinum, which Viren Bhagat prefers to other metals because of its high density. 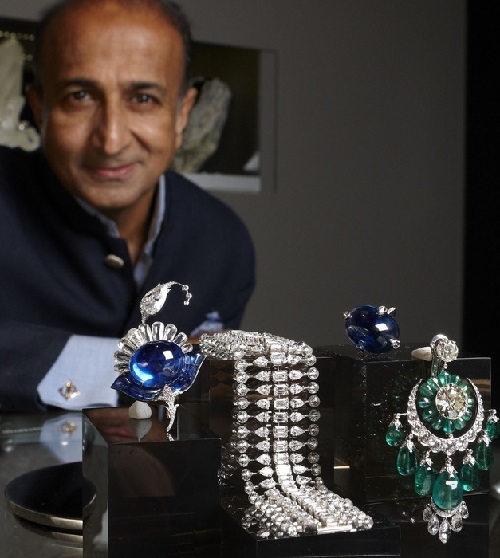 His favorite stones – the same sacred “five treasures” of Mughal era – diamonds, rubies, emeralds, sapphires and pearls. Often the stones for a piece of jewelry have been chosen for many years to finally create a unique and harmonious unity. 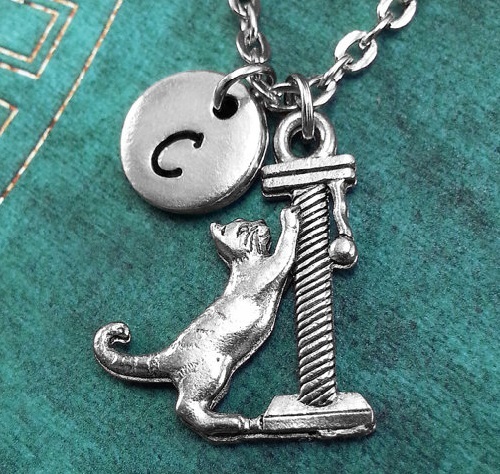 Jewelers of Michigan based shop Metal Speak make beautiful personalized hand stamped charm jewelry. The small family business consists of four creative women – Susan, Janessa, Jessica, and Jeremy. They all love art and express their talents working with metal. The process begins with inspiration and ideas, which then turns into real works of art. Sometimes their customers come to them with their wonderful and unique ideas or designs. Metal Speak masters are often allowed a glimpse into the lives of their customers to meet their wishes. Such thoughtful approach is very fruitful for both sides – customers and jewelers, and it makes Metal Speak jewelry unique. When the craftswomen are not working with metal, they enjoy painting, crocheting, digital art, and even woodworking.